This is an alternative to the Linn Sneaky DSM which is designed to be used with in-wall speakers. Earn 1750 loyalty points when you order this item. 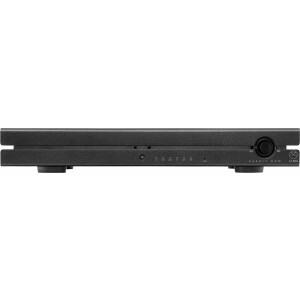 Linn Sekrit DSM Network Streamer + Amplifier is designed to be heard and not seen, it is a powerful network music player with combined pre/power amp. If you want great sound but don't want to see where it's coming from, choose Sekrit DSM and Linn Sekrit in-wall speakers for the ultimate hidden solution. Sekrit DSM is the latest addition to Linn’s leading range of DSM systems, bringing you all the benefits of Linn DSM in a slim and powerful package designed for custom installation. With six inputs, including three HDMI, Sekrit DSM provides all the connections you need to make every entertainment source in the home sound better. Music, movies, games, TV, radio, online sources such as Netflix, YouTube and Spotify… it even plays nicely with AirPlay. It’s easy to add a Sekrit DSM player into every room in the home and Songcast lets you enjoy all the benefits of multiroom, without sacrificing sound quality. Play the same thing in any room or something different everywhere. Share audio from the network - stored music, internet radio, or anything you can play on a PC, Mac, iPad or iPhone. You can also share audio from connected sources, such as a TV, DVD, Blu-Ray, or even a turntable, anywhere in the home. Housed in a compact package comprising a Linn DSM player, pre-amplifier and 50W Class D stereo power amplifier, Sekrit DSM is a great secret weapon for any custom installation. The Class D power amplifier means the unit is cool-running, providing great positioning flexibility. Mounting options include lugs for fixing the unit to a surface, e.g. under a shelf or on the wall behind a TV, and a 1U rack mount kit. Units can be stacked without the need for ventilation gaps and are completely sealed to avoid dust contamination. An RC5 accessory port lets you add a wall-mounted Basik 3 IR panel for control of volume and power in the room if desired and an IR repeater can be securely and easily attached to the clamping point on the front of the unit. Linn’s new Media Server, Songbox, instantly shares any iTunes music with Kinsky and is perfect for anyone who wants to use iTunes as their music library. Linn’s Songcast app is the only app that lets you instantly listen to any music or video content, such as iTunes and Spotify to YouTube and Netflix, through the hi-fi. With the recent release of Kinsky for Android, there are now even more Linn control solutions to choose from for the latest tablets or phones, providing simple and seamless control of the system.